Artist’s rendering of the Bartolomeo platform attached to the ISS Columbus Module. Image Credit: Airbus Defence and Space. An external research platform slated to be installed on the International Space Station (ISS) in late 2018 could facilitate access to the orbital laboratory for commercial users. The “Bartolomeo” platform will be offering its services while attached to the station’s Columbus Module. Developed by Airbus Defence and Space, the platform, dubbed the “ISS balcony”, will accommodate various scientific payloads up to 1,322 pounds (600 kilograms) and no larger than 35.3 cubic feet (one cubic meter) each. The platform will offer up to 800 W of power supply and a 100 Mbps data link. 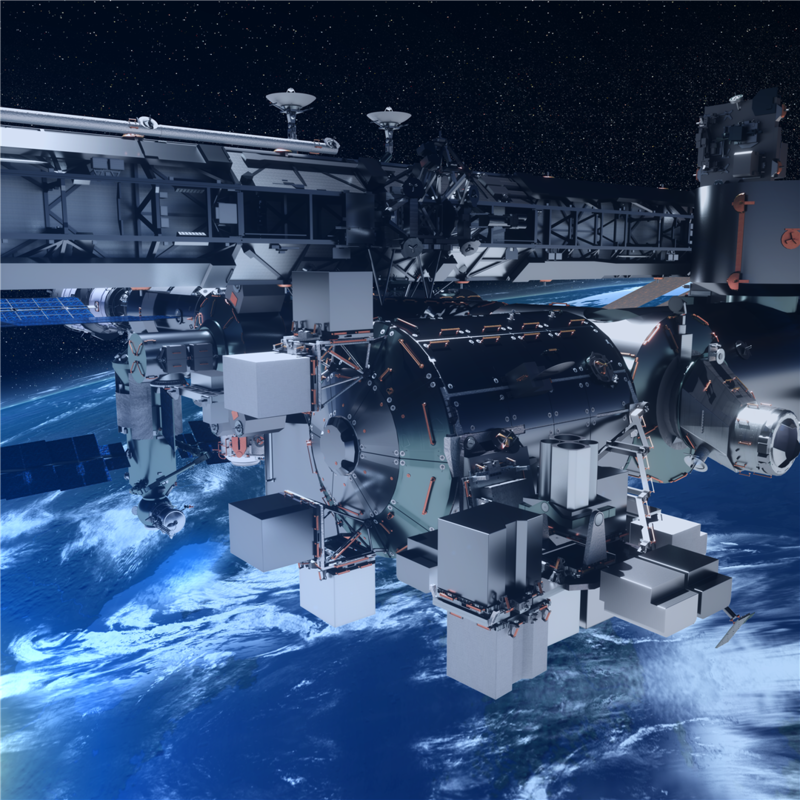 Bartolomeo is being designed with the aim of providing fast, cost-efficient and reliable access to the ISS for private and institutional users on commercial terms. Future customers would utilize the platform’s capabilities for a wide range of projects, including Earth observation, robotics, material science, astrophysics and new space flight applications. “Our ‘ISS balcony’ provides a highly cost- and time-efficient means to perform a space mission in LEO (low-Earth orbit) or to test and validate new technology in orbit,” said Bart Reijnen, Head of On-Orbit Services and Exploration at Airbus Defence and Space. Bartolomeo on-orbit configuration. Image Credit: Airbus Defence and Space. For Bartolomeo’s users, Airbus Defence and Space guarantees a complex mission service which comprises of preparation for the mission, payload launch, payload on-orbit installation, commissioning, operation, payload data processing, and delivery. The company hopes that it will let its customers fully concentrate on their scientific or technological objectives, without the need to worry about the technical aspects of the mission such as transporting the payload to the ISS. “Customers can benefit from our extensive experience in integrating and operating payloads on the ISS and are hence free to fully concentrate on their individual space mission, without needing to develop a complex space system or a deep understanding of the ISS,” Reijnen added. Moreover, the payload will not require any spacewalks to install it on the platform and to maintain it as Bartolomeo will be fully compatible with ISS robotic systems. The installation and de-installation of payload, as well as its servicing, will be provided by the station’s Mobile Servicing System (MSS). Bartolomeo will be capable of accommodating six Flight Releasable Attachment Mechanism (FRAM) and six JEM Camera, Light, Pan and Tilt Assembly Adapter Plate (JCAP) standard payloads. 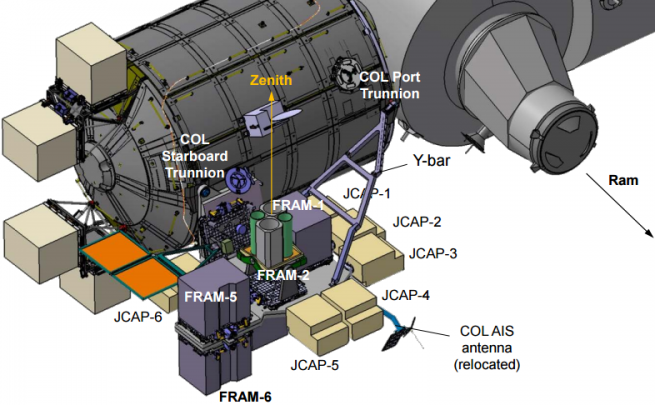 FRAM allows the hosting of up to 1,322 pounds (600 kilograms) of payload, while JCAP is designated to carry much smaller payloads – up to about 220 pounds (100 kilograms). Airbus Defence and Space underlines that the preparation for the Bartolomeo-based mission is very easy. According to the company, payload sizes, interfaces, preparation steps, and integration processes are largely standardized and, therefore, lead times can be as short as 12 months. What is also noteworthy, Bartolomeo will be the only external payload hosting facility suitable for unpressurized and pressurized payload launch. The platform will be optimized for offering an unobstructed view on both planet Earth and outer space. It will provide very good viewing conditions in the zenith, nadir, and forward direction, but reduced viewing sideward and some limited viewing in the wake direction. First Bartolomeo customer was revealed in September 2016. It is Neumann Space, an Australian space technology company interested in using the platform for its Facility for Australian Space Testing (FAST) program. The company will utilize 50 liters of the platform’s capacity to install a collection of payloads sent together with a minimum mass of 2.2 pounds (1 kilogram) each. The hardware for the FAST program will operate in space for up to one year. The Bartolomeo platform itself is scheduled to be launched aboard SpaceX’s Dragon cargo spacecraft in late 2018. The installation of the platform on the Columbus Module will require only one spacewalk. There is also the possibility of sending up to two FRAM-based payloads together with Bartolomeo and this option will be discussed further.